The Great Wall of China is obviously in China, but it is in different parts of China. The Great Wall of China travels through 58 cities. It starts at Hushan in east to Jiayuguan pass in west. 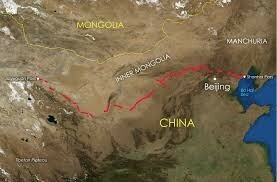 Then it traversing Liaoning, Hebei, Beijing, Tianjin, Shanxi, Inner Mongolia, Ninxia, Shaanxi, Gansu, and Ginghai. it goes from east to west China. It crosses deserts, grasslands, mountains, and Plateaus. While under the rule of Qin Shi Huangdi, Ch'in Shih Huang Ti planned The Great Wall of China. 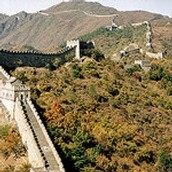 but because of Qin Shi Huangdi, the Great Wall was made possible. Ch'in Shih Huang Ti the ordered his son, Grand General, Meng Tian to go collect people to build the wall. Meng collected peasants, major criminals, but he also collected innocent people who were simply disliked by the emperor. Aproximately 300,000 soldiers and 500,000 laborers built the wall. At the time it was about 70% of the population of China. Before planning the Great Wall of China, a man came from his village. He said that his village was destroyed and claimed to be the only survivor. This gave an idea of how to save China. The people who destroyed the village were called, The Huns, and were said to attack more villages and then the empire, so Ch'in Shih planned a great wall to protect all the citizens and the emperor. When Was The Great Wall Of Built? The Great Wall of China was built in the time of Warring States, about 2,200 years ago. This was during the Ming Dynasty which lasted from 1360 to 1644. It began construction during the fifth century B.C., and ended during 221 B.C. Almost the entire Great Wall we see today had to be rebuilt due to warring and erosion.